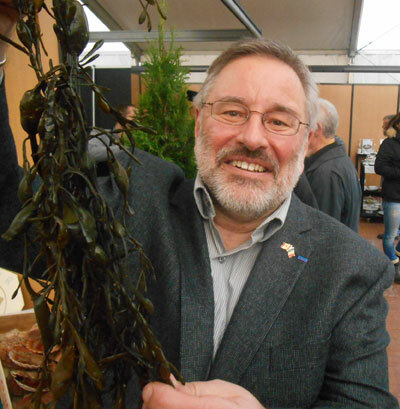 Dr. Thierry Chopin, scientific director of the Canadian Integrated Multi-Trophic Aquaculture Network and member of UNB Saint John’s Biological Sciences Department, recently travelled to Brest, France, to promote the unique relationship between marine biology, aquaculture and the culinary arts. The inaugural event was held at the impressive Oceanopolis Aquarium and Discovery Park, November 21-22, and incorporated all aspects of sea farming from water to table. The Seafood Fusion Festival provided an excellent platform to display the multi-leveled approach to aquaculture and farming on which Dr. Chopin’s work focuses. As an appetizer, he gave a seminar entitled “Integrated Multi-Trophic Aquaculture: an ecosystem approach to farming the sea” in which he explained the innovative uses that can be found for the co-cultured species and how to take advantage of the ecosystem services they provide. The chefs present at the two-day event incorporated sea-farmed products into their exquisite dishes, with a daily Producers Market featuring cooking battles and gastronomic creations. The emphasis was on shellfish and seaweeds to educate the public and demystify these marine organisms by showing how easy they are to cook with, the wonderful flavours they can reveal and their excellent nutritional value. Dr. Chopin gave another presentation entitled “A succulent recipe fusioning fish, seaweeds and invertebrates and good for the environment: integrated multi-trophic aquaculture (IMTA)” and gave several radio, blog and TV interviews. A number of “Seafood Échanges” allowed for present issues regarding the management and sustainability of marine resources to be addressed by organizing round tables between people who do not often sit together such as harvesters, aquaculturists, natural scientists, social scientists, economists, marine protected area managers, regulators, processors, retailers, chefs and restaurant owners, but should in order to find inter-disciplinary solutions. Always associated with energetic presentations by spirited chefs, the wide applications of aquaculture were on full display, highlighting new trends in cuisine. “It is time we do a better job with seaweeds and shellfish, aiming to widen the seafood gastronomic experience past the standard “plateau de fruits de mer,” said Chopin. Dr. Chopin has successfully established the trend of new aquaculture applications through his collaboration with New Brunswick’s own Picaroons Brewing Company, producing the kelp infused beer “Kelp on the Way” last year. The first batch sold out in a matter of days, proving customers are more than happy to experiment with the sea and their palates.